Gold can take support near Rs 31,800 and can face resistance near 32,200 in MCX. Gold and silver were trading lower in morning trade on Friday. MCX Gold futures were trading 0.50 per cent down at Rs 31,830 per 10 gram at around 10.45 am (IST), while MCX Silver futures were down 0.15 per cent at Rs 38829 per 1 kg. According to SMC Global Securities, bullion counter may witness profit booking at higher levels .Gold edged down on Friday but held near an over two-month high hit in the previous session, when prices surged over 2 per cent as a rout in global stock markets boosted the metal's safe-haven appeal. “Gold can take support near Rs 31,800 and can face resistance near 32,200 in MCX. While Silver can take support near Rs 38,600 and it has resistance near Rs 39,400,” it added. 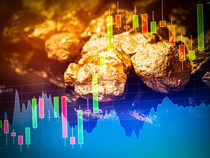 Latest holdings in the SPDR Gold Trust, the world’s largest gold-backed exchange-traded fund, rose 1.2 per cent to 738.99 tonne on Wednesday, the first gain since July and the biggest inflow since March. Coming to equity markets, the benchmark equity indices BSE Sensex and NSE Nifty staged a strong comeback by recovering nearly 2 per cent following fresh purchases made by domestic investors ahead of key macroeconomic data to be released later in the day, fall in global crude prices and rupee recovery.